Are you facing any problem regarding your BSNL landline, Mobile or Broadband connection? Are you looking for BSNL Customer care Toll-Free Number? If Yes, you are at the right place. Only Customer Care can solve your problem regarding such issues and here we are providing you the list of BSNL Customer Care Number. Updated Customer care number of BSNL and Toll free number BSNL as on 2018, are here to solve your problem. 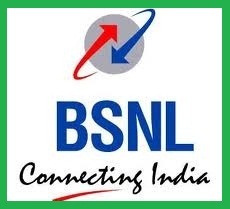 BSNL i.e Bharat Sanchar Nigam Limited is an Indian telecom state owned company, headquartered at New Delhi. BSNL has wide range of telecom infrastructure. Connecting 623 districts, 7330 cities/towns and 5.8 lakhs villages. By providing both land-line, mobile, 3G,4G wired interent service, wimax, IPTV and many more telecom services. In need, You may call customer care representative to enquire about various services of BSNL. If you have any issues, complaints or request regarding service activation, plans, billing or APN of BSNL or to apply for DND – Do not Disturb. Here are the list of all toll free numbers of customer care of BSNL as on 2018. For different services. For Mobile or Network Issues – Dial 1503 (Exclusively for BSNL mobile user) or 1800-180-1503. These are all India helpline number for solving issues or register complaint regarding BSNL services. The caller will not be charged for making this call as it is Toll-Free number. BSNL Landline User can’t get access through 1503 number. For Landline Phone issues- Dial 198/ 1500/ 1800-345-1500. These are all India helpline number for solving issues or register complaint regarding BSNL landline Services. These are Toll-Free number. For problem in Broadband- Dial 198/ 1504/ 1800-345-1504, are all India Broadband helpline number for solving problems regarding BSNL Broadband Services. These are Toll-Free number. For issue with MPLS-VPN- Dial 1800-425-1957, is BSNL MPLS-VPN help desk number which is also Toll-Free. 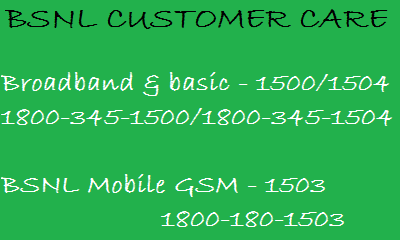 For problem in WLL/ WiMax- Dial 1502/ 1800-180-1502, are all India WLL/WiMax call center number which are also Toll-Free. If you are still not satisfied with the call you made to toll free number of BSNL. Or talking with customer care representative and your complain is still not registered or your query is unsolved. Then you can directly appeal to their executive by calling BSNL customer care number listed below, according to telecom circles of India. You can also register your complain through their portal and track your complaint status online. Disclaimer : Above listed State-Wise Customer Care Number are not Toll-Free Numbers. So the caller will be charged at the normal calling rates. Share your experience of BSNL Customer care services by putting your comment below. While we take several steps to deliver correct information to you. Still if you find any number wrong,do inform us by Commenting below or contact us. Just Dial *112# and Check BSNL Net Balance. can i know the bsnl complaint care number? What is the no. to talk to bsnl customer executives in bihar? internet connection is too slow.would u pls hel me.??? How do I check internet balance on idea tab s6000h?? I am unable to speak to BSNL Helpline Personnel on number 1500 etc., Call disconnects automatically after few seconds. How can I check my calling details and receiving list for the last one month. how to stop the caller tune?nd what is the customer care no. in jharkhand? How can i dial toll free number to kerala from Indonesia…. ?